Instant-win scratchies are well loved in Australia and now thanks to the expansion of online casinos, you can play virtual scratch cards for real money online without having to leave the house. As a luck based game, scratchies provide the perfect side game to your online pokies play, with scratch games available at the same pokies sites we recommend. We provide more information about how to play this fun, casual game at the leading casinos on the Web and the best instant-win games available. Most Aussies are familiar with this concept, but on the off-chance you’ve never heard of it, a scratch card (also known as scratchie or an instant) is a luck based, instant-win form of gambling. You purchase a card and then use a coin or similar object to scratch away the metallic panels and reveal the symbols lying underneath. If you unveil a winning combination, you instantly win a cash prize of a pre-determined value. 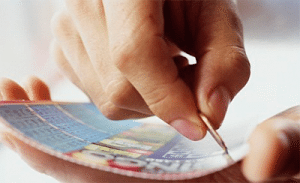 In Australia, scratch cards can be purchased from land based retail outlets like newsagencies, petrol stations, convenience stores, supermarkets and other lottery outlets, with any winnings cashed-in automatically over the counter. Advances in online gambling software means these beloved instant-win games are now available to play directly over the Internet from the comfort of home. It’s exactly the same concept but without a trip to the store, without the mess and without the wasted cardboard. Better yet, scratchies are available at many of our recommended online casinos, so if you already have a registered account with an online pokies site, you can use the same account to play real money virtual scratch cards right away. Instant win scratch cards are available at many leading online casinos, often listed in game categories as ‘other’, ‘arcade’ or ‘fun’ games. Microgaming is the software developer behind a majority of scratchies, but you’ll also find instants from NetEnt, BetSoft and Play’n Go. Our top recommended Aussie-friendly casinos which offer both pokies and scratch cards are listed in the table of recommended casino sites above. Play scratchies instantly over your Web browser without the need to have to download any software. All you need is a solid Internet connection and you can play anywhere in the world. Sign up for an account at any of these recommended casinos using our links above and you’ll receive some fabulous welcome bonuses, like free spins on the pokies and matched deposit bonuses. These venues also offer hundreds of real money pokies games, so you can use your AUD bankroll to fund both pokies and scratchies from the one safe account. Sign in and head to the casinos banking or cashier section. Select a trusted payment method like Visa, MasterCard, Neteller, Skrill, Paysafecard, or Flexepin, all of which will give you instant access to your funds, while bank transfers are available but may take a couple of days to process. Enter the amount of AUD you wish to transfer and follow the prompts to complete your payment. That’s it – all you need to do now is find the scratch card you wish to play and get scratching. Any winnings will be automatically credited to your account, so sit back and enjoy the thrill. Bunny Boiler Gold – not your typical scratch card, this instant-win game from Microgaming will keep you on the edge of your seat as you roll the dice to determine how many steps the bunny takes in his underground journey. 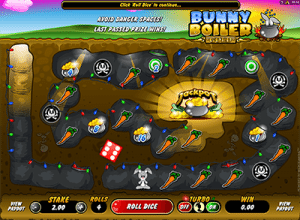 Land on a danger space and the game ends, but land on a carrot and you’ll continue to thrive as you make your way towards the jackpot at the end of the tunnel, stopping on bags of cash as you go. Give it a scratch at Royal Vegas Casino. 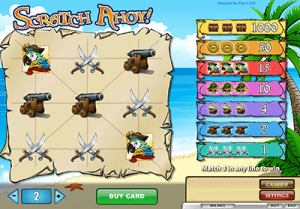 Scratch Ahoy – this lively scratch card from Play’n Go uses a fun pirate theme, with advanced software simulating the act of scratching each panel with a computerised coin. Scratch to uncover parrots, canons, swords, ships, pirates and treasure chests to win up to 1000 times your bet. Play Scratch Ahoy at House of Jack. 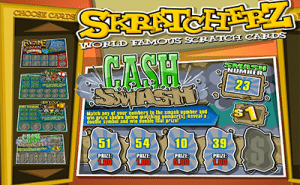 Skratcherz – this 90’s graffiti style scratch game gives you the option of selecting between four different scratch cards including Fortune Cookie, Deluxe Bucks, Double Deluxe Bucks and Cash Smash. Use the virtual coin to reveal each panel and collect a number of instant-win cash prizes. Play Skratcherz at G’day Casino. 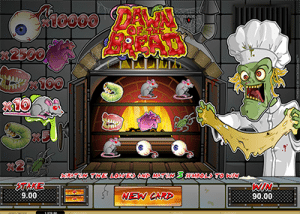 Dawn of the Bread – an oldie but an absolute goldie, this classic online scratchie takes a zombie theme and crosses it with a bakery. The result is a riotous game where the insane zombie baker stands to the side as you scratch to reveal bugs, rats, human organs, eyeballs and false teeth as they bake away inside pies in the oven. Completely crazy? Absolutely – and this is why we love it. You can also stake up to $9 per card, and with a maximum win of 10,000X your active bet can equal some serious dough. Try your luck at All Slots Casino. All of these scratchies are available for instant-play directly over your web browser, while Microgaming titles can also be played via exclusive downloadable software available at Royal Vegas Casino and All Slots Casino. Why are Web scratchies better than land-based scratch cards? Convenience – no need to duck into your local newsagent or remember to bring any winning cards back to be cashed in. Simply fire up your computer, kick your heels up and enjoy. Security – not only is playing at our recommended casinos safe, but gone is the worry of losing a winning scratch card, or your scratchie falling into the wrong hands, as all online wins are processed on the spot. Cleanliness – there’s no mess, no fuss, and no environmental nuisance of extra rubbish. Bonuses – online casinos offer all kinds of bonuses and incentives not offered by retail outlets, so you’ll get more bang for your buck when playing online. Want to try instant-win scratch cards online? Sign up for an account with Royal Vegas Casino, a leading venue for both Web scratchies and real money pokies, and claim up to $1200 in new player welcome bonuses.